Huawei P20 and Huawei P20 Pro smartphones are just one day away from launch and yet the leaks are still pouring in. While most of the expected specifications, features, and pricing have already been revealed, a new report has divulged the full details of the upcoming handsets. Meanwhile, a few other reports have also showcased the venue details of Huawei’s launch event that is scheduled to take place in Paris on Tuesday, where it is also expected to unveil a Porsche Design Huawei Mate RS smartphone as well. Let’s start with the leaked details of the two smartphones. 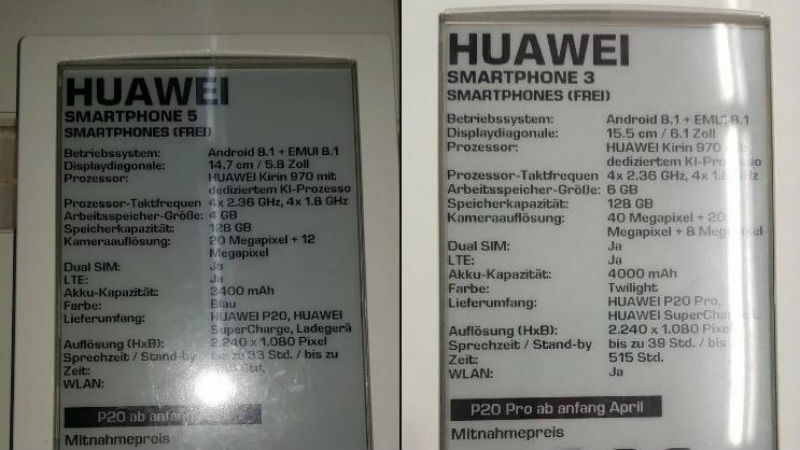 As per a GizChina report, a German retailer named Saturn has leaked specifiications sheets of the Huawei P20 and Huawei P20 Pro. The leak confirms earlier reports of the Huawei P20 Pro arriving with a triple camera setup. According to the leak, the handset will have three cameras at the back with 40-megapixel, 20-megapixel, and 8-megapixel sensors. Additionally, the report says that the Huawei P20 will only have a dual camera setup with 20-megapixel and 12-megapixel sensors. According to previous reports, the 40-megapixel rear camera will serve as the primary camera in the Huawei P20 Pro, which will include the 8-megapixel telephoto sensor and the 20-megapixel monochrome sensor. Meanwhile, the new report confirms other specifications that we already know, such as a 6.1-inch display, Kirin 970 processor, Android 8.1 Oreo-based EMUI 8.1, and a 4000mAh battery. Coming to the Huawei P20, as per the leak, will sport a 5.8-inch (1080×2240 pixels) display and will be powered by the same Kirin 970 processor. It will have a 4GB RAM and 128GB inbuilt storage and will be fuelled by a 3400mAh battery. While these are specifications which we already knew in previous leaks, the latest report does not reveal any additional details. Interestingly, the latest leak also reveals pricing details of the smartphones. While the Huawei P20 is said to come with a price tag of EUR 649 (roughly Rs. 52,200) for the 4GB RAM/ 128GB storage variant, and the 6GB RAM/ 128GB storage model of the Huawei P20 Pro is said to be available at EUR 899 (roughly Rs. 72,400). Notably, an earlier report had also leaked pricing details of the handsets. When it comes to the launch event, a GadgetMatch report has leaked images of the alleged Huawei P20 event showcasing it’s “MOOORE” logo. Notably, one of the walls at the event shows the name “Porsche Design Huawei Mate RS”. The report says that the new smartphone will be launched alongside the P20 and P20 Pro. The company had already posted a teaser on March 24 around the Porsche Design handset on Twitter.